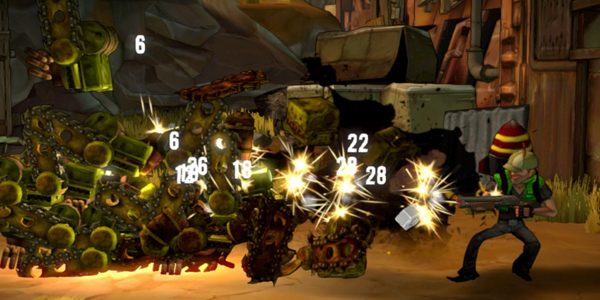 SHOOT MANY ROBOTS by UBISOFT and DEMIURGE STUDIOS does exactly what it says on the box (if it had one that is). This side scrolling feast of carnage is, for my simple mind, very entertaining. OK so it's not up to the quality of Rayman, but it doesn't aspire to it. I reckon it knows it's place and just gets on with it. Now of course there are the purists out there who hate SHOOT MANY ROBOTS because of its repetitive game play. Not me, I just like the simplicity of it all… nicely designed, great humour and just plain old fun. OK a number of levels are reproduced, but to me it's all about the action! It won't win side scroller of the year (if there is such an award) mind you, but for the price I wouldn't complain. There are a lot more expensive and worse games out there that's for sure! You can download SHOOT MANY ROBOTS on XBOX Live Arcade for 800 Microsoft points, which isn't a great amount for a bucket load of fun. The game revolves around P WALTER TUGNUT (P stands for "PICKLES"), a likable redneck who's been busy stockpiling his RV with weapons and beer ready for the forthcoming robot apocalypse (Terminator with a sense of humour). WALT drives his RV from location to location, shooting as many robots as is possible whilst drinking beer (for health) in a frenzy of mayhem. There are endless amounts of un-lockable content which you can equip yourself with, collected from the nuts of dead robots, from your RV's bathroom (for some strange reason) including outfits, weapons, and a nice selection of hats. All of which give Walt added attributes and special abilities. 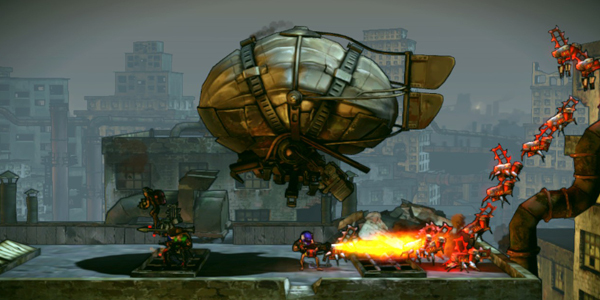 There's a wide range of robots to dispatch, ranging from little chain saw wielding CHOPPERS to massive FATBOY robots. As you progress variations of all these begin to appear (shed loads of them!!!) Each level is nicely laid out in a sort of 2.5D effect. But it's not just a case of getting to the end, in fact the main thing is getting high scores so you can progress. Another great thing about this is the on-line 4 player co-op, which involves you and 3 friends kicking bottoms and gaining nuts for robot killing. I must admit the controls were a little odd at first, as you only use the left stick for moving and aiming, and the buttons for jumping, shooting etc. If you want to aim more accurately, you have to hold down the left trigger. It's no big deal and easy to adapt too. 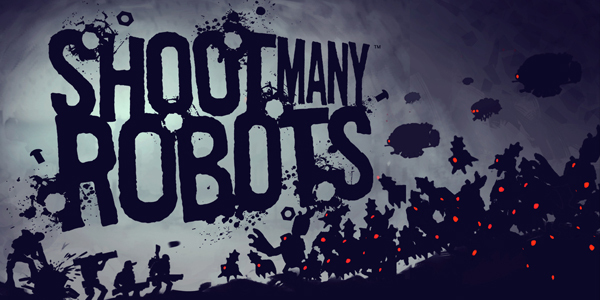 SHOOT MANY ROBOTS is the first release from independent game developers DEMIURGE STUDIOS and not a bad effort really. As gamers I think we have to show support to the indie games companies as they are the future of gaming. This title may not be the best game on XBLA at the moment, but it is far from the worst, and it has given me more enjoyment and playability than quite a few so called high end games that have been in my console lately. 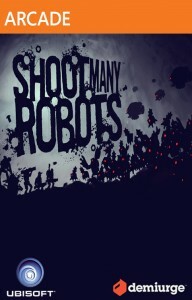 SHOOT MANY ROBOTS is a great little game for the money. OK it has its faults, but not many. If you look at this as just a bit of fun, and don't go all geeky about it, then you're in for a good few hours of entertainment with your mates. I give this 8 out of 10 and a great effort by an independent developer.